Choosing a putter is like choosing a baby. Wait, that didn’t come out like I wanted. You know what I mean though. Putters are personal. It’s important that we “click” with our putters. We like looking down at it before each putt (no matter if you have to do it three times each hole). I’ve always been a putter nerd. I’ve owned probably 20 putters over my golf career. I love going back and playing with an old one. It brings back all of the good (and bad) memories that I once had with it. It’s very easy to “go cold” after a while with a putter, so I find it convenient to be able to have numerous putters to choose between to light that fire back again. If you are the same way, you’ll love this article! We’ll be talking about the best putters that you can buy in 2019. What the hell does “best” even mean? Fair question. Actually, let’s be real for a second: just about all putters perform the same. We just like and feel comfortable with certain putters. Some people find that they can aim better with a specific model putter (for example, a center shaft mallet) vs another model. Some people find that they prefer the feel of a milled putter, instead of an insert putter. So, really, you just have to try lots of putters to find out what you like. My advice to you is to go to a local PGA Tour Superstore (or something similar). You can try out all of their putters. If you want to save some money, you can determine which putter you like and then go back home and buy it online for cheaper. That’s what I would personally do. 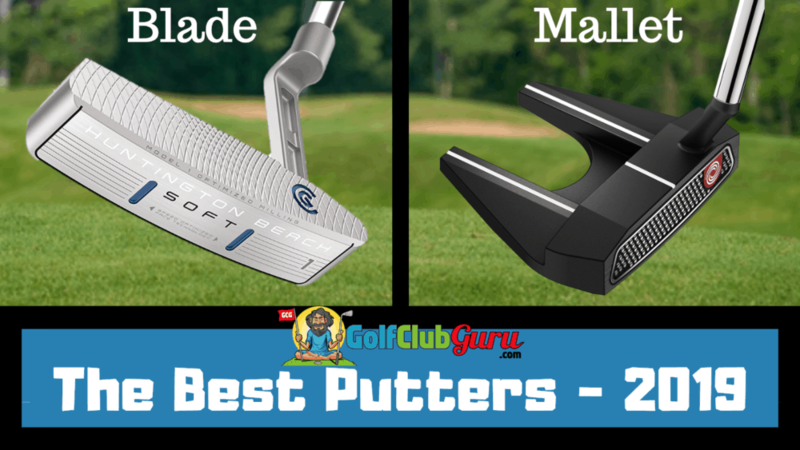 I will say this, though: 2019 is set to be an incredible year for putters! Let’s get started. The new Cleveland Huntington Beach Soft putters look phenomenal. I’ve loved the prior release (the original Huntington Beach), and these seem one notch better. Their milling process typically results in a pretty firm sound/feel at impact, and this year is not different. What IS different, though, is that the control is much better when struck on the center of the face. Just check out the milling design above. I’m very excited to try them when they are released to the local stores. When it comes to their models, I’m a big fan of the simple #1 blade model. The simpler the better when it comes to blades, in my opinion at least. You just can’t go wrong with any putter that starts with “Odyssey White”. I’m a huge fan of their soft, insert putters. I’ve played many different varieties of these. I’ve had a White, a White Hot, and a White Hot Pro 2.0 like this one. The sound and feel of a soft Odyssey putter is pretty incredible. It’s like you are hardly hitting the ball at all. The golf ball simply gets in the way of the putter. That’s what it feels like, at least. One of my favorite practices when it comes to putting is switching from a milled putter to a soft insert putter like this one. The difference in feel is astronomical. I’ve always found it entertaining for some reason. Similar to the Cleveland putters that I talked about above, the standard #1 model blade is hard to beat. I really like the sight line being on top of the club, as I feel it’s much easier to align to the target that way. The Wilson Staff 8802 putter is just a thing of beauty. I first tried it at an Edwin Watts (during my standard one hour free putting practice during a rainy day…. any one else? Just me? OK) and I instantly fell in love. It is by far the thinnest, most compact putter that I would ever game. Alignment was surprisingly easy, something that I expected would be near impossible. It’s a milled design, but it sounded and felt great at impact. The roll was always as pure as can be, too. Let’s just say this is THE #1 club on my watch list. I’d highly recommend you try it out for yourself if you can get your hands on it! Cleveland putters have been highly underrated for far too long, in my opinion. Their milling process is top notch, yet you hardly ever hear anyone talk about their putters. Considering their fair prices, I was down to try one out a couple of years ago (the Huntington Beach #1), and I’m glad I did! If I was a mallet fan, I would go with the new Soft #12 model. It’s got a great shape and a very easy to follow alignment aid. Many golfers have the toe of the putter much higher than they realize, which can make it more difficult to correctly align to your target on the putting green. The Cleveland 2019 Huntington Beach Soft #12 putter’s alignment system ensures that the putter is flat on the ground though. If the lines on the top and the bottom of the putter don’t line up, you’ll easily adjust and make it right before your putt, which is a huge plus. I haven’t been a fan of many of Odyssey’s more creative releases in the past few years. However, the Odyssey Black & Chrome O-Works Tank #7 putter is an insanely easy putter. When I say easy, I mean easy. Alignment is a breeze. Putts roll end over end every time. My stroke felt controlled and on a perfect arc without even thinking about it. I used it for about an hour on the putting green, and I honest to god was probably putting the best of my entire life. I felt like I couldn’t miss! Obviously, your results may vary, but you should definitely try it out if you can. My best guess is that the alignment sight lines just really suited my eye when I was addressing the putts.